TOP LASER TECHNOLOGY WITH THE SAFETY OF A TOP MEDICAL PRACTICE. OF A TOP MEDICAL PRACTICE. Enjoy in Greece the experience of top Medical Laser Clinics of the USA. We have Top Medical Technology approved by the strictest US Organizations (FDA). Laser targets precisely the hair root, heating it and deactivating it. It does not affect the skin. It does not have any complications. Laser hair removal is the only hair removal method achieving permanent results. Your skin is smooth and soft after Laser application, just like a baby’s skin. And this is not an exaggeration! Laser hair removal is nothing like traditional methods. You can forget forever skin irritation, in-grown hair and pimples. In most parts of the body, you will only feel some pinching that is perfectly tolerable. Mean treatment duration is 45 minutes. In New York Laser Clinic Laser Hair Removal is applied under strict medical supervision. 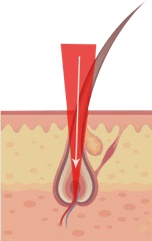 The innovation of 4th generation Lasers relies on their ability to increase the temperature only in the hair root, leaving intact the surrounding tissues (Skin). They produce a focused light beam, which is exclusively absorbed by the hair, not the skin. Laser aims at deactivating the hair through the overheating of its root. Laser uses the property of melanin to absorb light energy. Through this mechanism, it increases the temperature within the hair follicle at 90 oC, thus achieving its deactivation. This process is completed in such a quick and targeted manner that skin around the hair is not affected at all. 90% of New York Laser Clinic visitors enjoy incredible hair reduction within just 3 sessions, and complete hair elimination at a rate of 85-95% after 6 sessions! Hair reduction will be evident even from the first session, with softer and more light-colored hair. The exact number of sessions required by each person to eliminate hair effectively depends on a series of factors; the area hair removal is applied, hair type, skin color, hormonal and inherited factors, as well as on the use of certain medical treatments and other factors. During the initial appointment, New York Laser Clinic’s Physician will examine your skin and your hair growth pattern and he will inform you about the exact number of sessions you will need. Absolutely! Laser hair removal is one of the most well known treatments of Aesthetic medicine, and the one more researched. It is applied Safely to millions of patients in the last 20 years and it has been approved by the strictest competent organization, the FDA (US Food & Drug Administration). The 4th generation Lasers for hair removal that we use in New York Laser Clinic exert their action on the hair root exclusively. 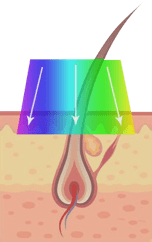 They target melanin, the concentration of which is greater in the root, and through flashes of light that last for tenths of a second, they increase the temperature within hair follicles and deactivate it, leaving the surrounding tissues (skin) intact.